Where is Erik the Red? 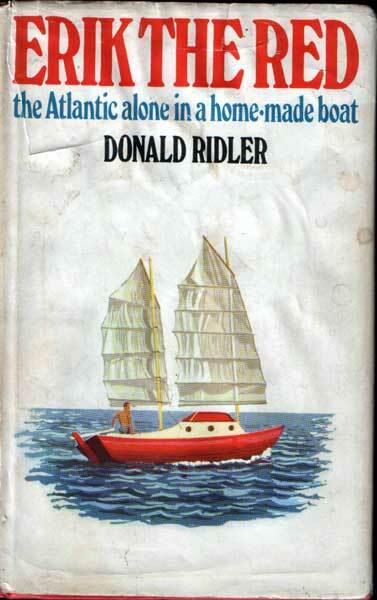 Nick Duffy of Paget, Bermuda is travelling to the UK shortly and wishes to see Donald Ridler’s home-built dory Erik the Red, as immortalised in the epic book describing how he constructed the boat in his paerents’ garden and then sailed it across the Atlantic. Erik the Red was last heard of at the Exeter Maritime Museum, which closed some years ago. Does anyone know the whereabouts of this boat and whether it will be possible for Nick to see her? I would guess that she’s likely to be in store somewhere, but if any reader has information please contact me at gmatkin@gmail.com and I will pass it on. By the way, the Eventide Owner’s Group, which sells the Mouette plans from with Erik was built, has its own story about what happened to the boat, and this small snippet of information about a larger boat built using the same plans. A number of Amazon sellers have copies of the Donald Ridler’s original book Erik the Red . Author adminPosted on August 5, 2010 July 7, 2015 Categories Boatbuilders and restorers, Boating, boats, ships and the sea, Culture: songs, stories, photography and art, Designs and designers, boat plans,books of plans, Events, History, Locations, Sailing boat, Sailing cruisers, Small boats, Suppliers, Traditional carvel, wooden boatTags boat plans, boatbuilding, donald ridler, dory, erik the red, eventide owners, Sailing boat, transatlantic voyage15 Comments on Where is Erik the Red? Jay Cresswell has been in touch to tell us about some more video of the Grand Bankers of Portugal – see Comments in the left-hand column above left. He’s also been in touch to say that within a few years, there will be as many as three restored four-masted schooners built in the 1930s for use in the Grand Banks fishing grounds. But to return to the video, the material he has found is marvellous footage of the schooners, their wooden boats and the fishermen themselves – six sections of film titled The Lonely Men of the Dories – the link above goes to section 1, but the rest are linked below. By the way, don’t let the title you see in the Youtube pages worry you – the voiceovers are in English. Here’s a fabulous piece of film following the crew of a Portuguese schooner fishing off the Grand Banks in the middle of the last century, complete with footage of dories stacked on deck and being rowed and lifted aboard, and the fishermen themselves hauling long lines, gutting fish, getting lost in fog and even attending the funeral of a fellow crew member. The commentary feels a little over-cooked for our times – whoever wrote it may have been reading a little too much Hemingway – and the screen is a little fuzzy, but what it shows is priceless for anyone with an interest in this aspect of maritime history and the boats involved. I’m grateful to the excellent Mal Nicholson, owner of the Humber supersloop Spider T (of which more soon!) for letting me know about it.